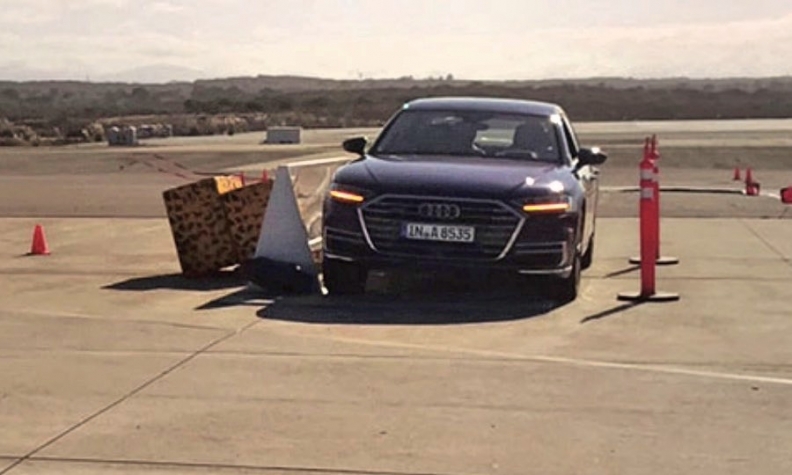 To simulate a collision from the side, large yellow foam bricks are pulled toward the Audi A8 at 30 mph. The sedan senses the collision and raises itself to better absorb the energy of the impact. MONTEREY, Calif. — The term "active suspension" has now and again turned up on vehicles over the past 30 years, but it was always a bit of a misnomer. It referred to systems that largely smooth out the ride over bumps in the road — thus more a "reactive" suspension than active. 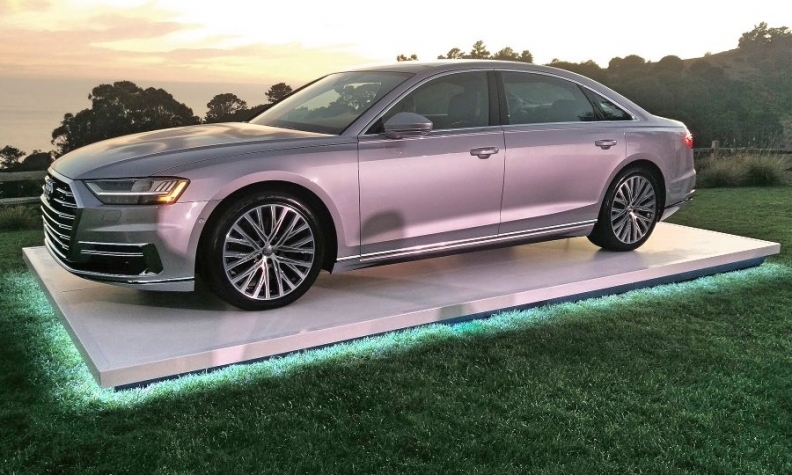 But that begins to change this year with U.S. introduction of the redesigned Audi A8 sedan. Thanks to a circle of active sensors, an on-board 48-volt electrical system and lightning-quick electromechanical actuators, the big German luxury sedan's predictive active air suspension can do more cool tricks than a well-trained service dog. One example: When equipped with the optional top-end suspension system, the A8 can sense an impending side impact and raise the side of the vehicle by 3.1 inches, allowing the heavily reinforced sill to absorb a larger portion of the collision energy. Audi demonstrated the features to journalists this month at a former airfield here, though the predictive active suspension won't be available as an option until next summer on 2020 models. The redesigned Audi A8, coming to U.S. showrooms this quarter, will be better able to handle potholes and speed bumps. Large yellow foam blocks simulating the front of an oncoming vehicle were placed on a sled that was pulled toward the passenger side of a parked A8 at 30 mph. 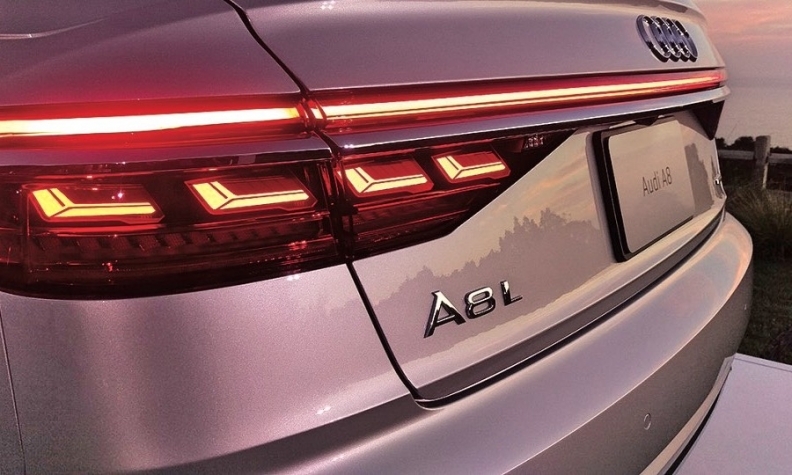 At the threat of a side-impact collision — as determined by the side-mounted sensors — the A8 braces itself. The sedan arms its airbags and, as the threat increases, closes windows and the sunroof, and finally, at the last second, uses the air suspension to raise the vehicle on the side of the impending crash. Audi says the system's effectiveness will depend on the characteristics of the oncoming vehicle, but by increasing the height more of the impact can be absorbed by the high-strength steel in the sill and body structure, instead of the weaker doors. The added side-impact protection also handles potholes in an unusual manner. Shock absorbers and/or struts keep a vehicle's cabin stable while the wheels and tires absorb the shock of striking the edge of the hole. With the A8's suite of on-board sensors, the sedan can see the tire heading for a pothole and somewhat suspend the wheels from falling too far into the hole, easing the strike on the trailing edge of the hole and smoothing the ride. The same technology allows the A8 to absorb speed bumps with almost no discernible impact in the cabin and keeps the big sedan from diving during hard stops and squatting during hard acceleration. The A8's on-board sensors — including radars, laser detection and cameras — also enable the sedan's driver assist system, including lane-keeping and Audi's traffic jam assist, an adaptive cruise control system that automatically brakes and accelerates in traffic. During a 40-mile test drive, the driver only once felt the need to intervene — when a lane approaching an intersection split in two with no additional markings. Optional four-wheel steering, which will be available at launch, also gives the A8 the turning radius of a small sport sedan such as the A4. The A8 — which starts at $84,795, including delivery — was first shown in Barcelona in spring 2017 and is on sale in Europe. U.S. dealers have begun ordering the new A8, and vehicles are expected in showrooms this quarter.